The cloak that Jesus says is the biggest danger is NOT a cloak of anonymity but a sheep-skin cloak that gives the impression someone is a Christian prophet/teacher. For too long, Michael Brown has hidden his ‘lupine’ nature beneath his Pensacola ‘petticoat’. It would be nice if he actually stood on the authority of scripture rather than the authority of his Brownsville Revival hoax. Rosebrough exposes Dr Brown as a NARpostle at Isi De Gersigny’s circus church? If Dr Brown is attempting to deceive people into thinking anonymous sites are not credible based on their anonymity, he clearly does not know how to practice biblical discernment. 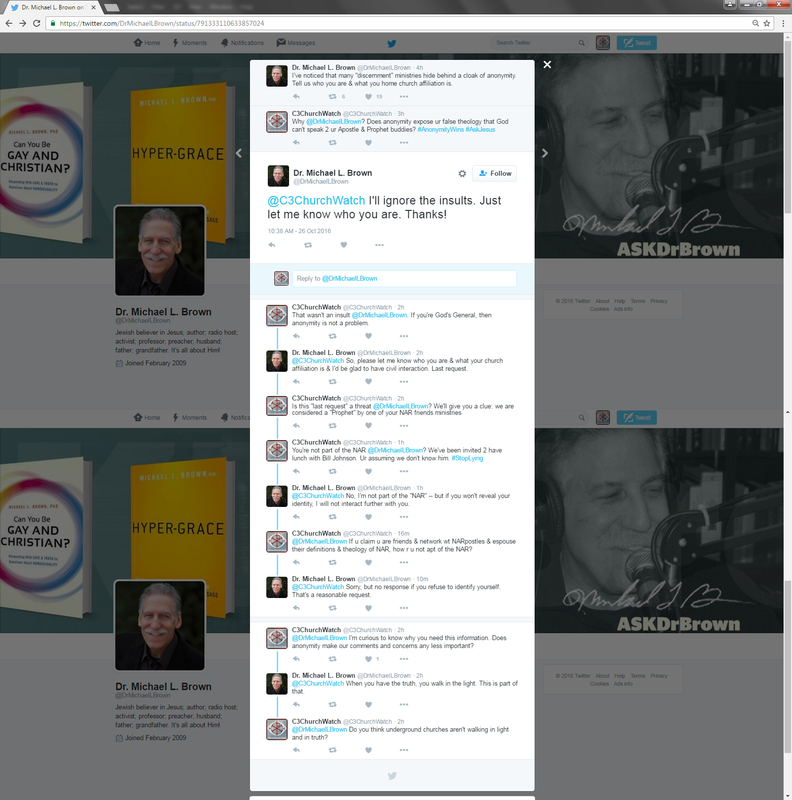 Michael Brown has deliberately misrepresented ChurchWatchCentral both on Twitter and on radio. We have never claimed to be a ministry. On all our sites, we have made the claim “we started as a group of concerned leaders, pastors and elders from various denominations.” Nothing more. But apparently that information is not good enough for Dr Michael Brown. We first made the claim tentatively that Dr Michael Brown was a NARpostle when we broke the story on the Naked Cowboy. This caused Michael Brown to slander us and lie about the nature of Pensacola. “Aside, then, from stating accurately that I “played a significant role in the revival,” everything else in the paragraph was patently false. Unfortunately for Dr Brown, everything in our paragraph was patently true. Later this year, we further backed up our claim with evidence that Michael Brown is a NARpostle (see first link above). Chris Rosebrough reviewed NARpostle Steve Hill’s opening sermon of the revival and exposed how Hill was overtly manipulative in manufacturing the Pensacola mess at its inception (see second link above). Rosebrough also reviewed Yonggi Cho speaking at Pensacola, allowing Cho to talk about how HE “prophesied” the coming Pensacola “revival” (see third link above). Rather than ever deal with the mounting evidence backing our allegations, Michael Brown has gone out of his way to attack our credibility ever since we raised the lid of his NARpostolic regime. His ‘character assassination’ attempts against CWC should be an indicator to Christians everywhere that Michael Brown is NOT being upfront about who he is. That’s very strange behavior of Dr Michael Brown. Who’s he kidding by acting like he actually ‘vets’ information? Brown takes whatever nonsensical phrases get spewed out of unbiblical hoaxster Bill Johnson’s mouth seriously, Brown takes Look-I’ve-Got-An-Angel-In-My-Back-Pocket heretical fruitcake Sid Roth seriously, Brown believes in the Toronto Laughing Gas, but Brown disputes Churchwatch’s simple and straightforward “about me” pages? Who’s Brown kidding? What a joke! That contradiction may in part explain why Dr Michael Brown has no Discernment Website of his own. So, let me get this straight. If believers heed the warning of :1 John 2:26 (These things I have written unto you concerning them that seduce you.) And if believers follow what we were instructed in :1 John 2:27 (But the anointing which ye have received of him abideth in you, and ye need not that any man teach you; but as the same anointing teacheth you all things, and is truth, and is no lie, and even as it hath taught you, ye shall abide in him. )Then they are not creditable believers? What is his understanding of credibility? According to this scripture, we should only be taught by the Holy Spirit. Why is he teaching when 1 John 2:27 tells us not to be taught by man? Are these creditable questions?